MPP Glen Murray came to Hamilton Friday to formally announced the city's new GO station. The new James Street North GO station will have an attached parking complex for 300 vehicles and bring two more commuter trains in and out of Hamilton a day. The official details on the James Street North GO Station were revealed Friday by Ontario's minister of transportation. "It's not often that you get to build a new train station," MPP Glen Murray told media at a news conference Friday afternoon. Murray formally announced the new GO station, located at 353 James Street North near Liuna Station, along with local MPP Ted McMeekin and Mayor Bob Bratina. The station will include an attached, multi-level parking complex with 300 spots. Murray said there will be two additional train trips from Hamilton to Toronto in the morning, and two more trips from Toronto to Hamilton in the afternoon, keeping with Metrolinx's all-day service commitment. Service from the James North station is meant to complement service out of the downtown terminal. "CP and CN own the track after Aldershot...There is a lot of competition for space and time between Hamilton and Aldershot so we continually negotiate with them," Murray said. "Having the second station will open up additional access to additional rail lines allowing us to have two more trains in the morning and two more in the afternoon." Murray said the province currently rents the tracks for regional commuter service. Next step to him is getting GO service rights-of-way in the Aldershot area to make the service smoother. 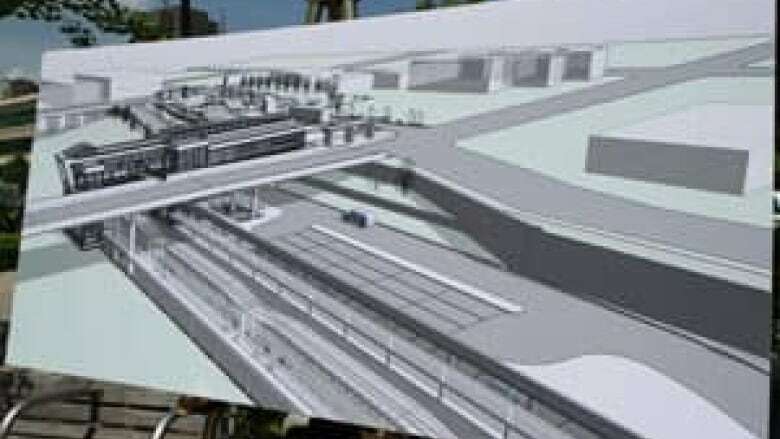 At an April 30 meeting, Metrolinx revealed the station will have a large, outdoor plaza. "We're still seeking a lot of feedback from the community," said Paul Finnerty, Metrolinx's vice-president of operations for GO Transit. "We want to ensure this building fits in with the area residents. While there is a rough design for the new station, the final cost won't be known for some time. A bidding process will determine who will design and construct the new station, if the government doesn't build it in-house. "The way we manage these contracts depends. Some are built by the government and some are built by a traditional tender system," he said. "There is a criteria we go through as a government to determine which one gets us the best value and the best service product at the end." But Murray said the station will be paid for in part by the $16 billion in transit funding from the Ontario government to the Greater Toronto and Hamilton area. Construction and service implementation will be a two-stage process, said Finnerty. Stage one is slated for completion by the July 2015 Pan Am Games. That includes construction and the all-day, two-way service. Stage two will begin after the Games in August 2015. That will be the remainder of construction and assessing more frequent service, he said. James Street North GO Station construction is expected to start in early 2014. Interested in LRT? Worried about the cost? Come back to CBC.ca/Hamilton Tuesday at 7p.m. for our live chat and webcast panel discussion on Metrolinx funding with host Julia Chapman.